“Delicious” isn’t really the first word that comes to mind when we think of medicinal plants. Most of us probably picture a stringy green blob of some no-doubt powerful herb, or an odd-smelling tincture of bark or roots. It might be worthwhile to choke them down for the sake of your health, but they certainly aren’t foods we’d choose to eat, given the option of something more appetizing. This is actually a false assumption, though, since spices – which we deliberately add to our food to make it taste better – are some of the most powerful medicinal plants around. Some of the earliest folk remedies in ayurvedic and traditional Chinese medicine involved spices of one kind or another, and as it turns out, the old wives’ tales might actually have a grain of truth to them: spices are powerful medicines, and free of many of the side effects that make prescription medicines so dangerous. A quick overview of blood sugar (also called blood glucose; glucose is just a kind of sugar): when you eat a food containing carbohydrates, your body uses those carbs for fuel, especially for your muscles (that’s why athletes generally need more carbs than the rest of us). Insulin is the hormone that opens the door into the muscles, and lets the carbohydrates in. In a metabolically healthy person, this will result in a predictable pattern after a carbohydrate-rich meal: a temporary increase in blood sugar, and then a decrease as all that sugar leaves the blood and enters the muscles instead. In diabetics on the other hand, blood sugar is chronically high, because diabetics either don’t produce enough insulin (Type 1) or their muscles aren’t getting the message from the insulin signaling (Type 2). Chronically high blood sugar is bad news: it sets off a vicious cycle of inflammatory reactions, and often ends up being stored as fat (the reason why diabetes and obesity are closely related). To summarize very briefly, chronically high blood sugar is a serious problem, and blood sugar control is especially important for diabetics. So how can spices help with this? First up to bat is cinnamon. It’s a delicious coincidence that cinnamon goes so perfectly with sweet potatoes, because from a health perspective, it’s the perfect accompaniment to everyone’s favorite safe starch. In one study, 3 grams (just under 2 teaspoons) of cinnamon every day for eight weeks improved blood sugar control, lipid profile, and BMI in diabetic patients. Another study found important benefits for doses as low as 1 gram (less than a single teaspoon) daily. Even healthy people can benefit from this. One study fed patients rice pudding, and found that pudding flavored with 3g cinnamon helped control the insulin response to the carbohydrate-rich meal (in other words, it helped them metabolize the carbohydrates better). A less famous seasoning is fenugreek, a spice best known from Indian and Middle Eastern cuisine. In one study, fenugreek seeds at lunch and dinner improved blood sugar control and blood lipids in Type 1 diabetic patients. Fenugreek probably wouldn’t go well with your sweet potatoes, but why not roast up some white potatoes in butter or coconut oil, with a sprinkling of fenugreek and curry powder? Blood lipids (triglycerides and cholesterol) are a topic of hot debate. There’s no real evidence to prove that dietary cholesterol raises blood cholesterol, but that doesn’t necessarily mean that blood cholesterol itself is harmless; it just proves that egg yolks are innocent of raising it. So even if you’re happily and healthily chowing down on butter, liver, and other extremely nutritious cholesterol-rich foods without a trace of guilt, blood lipid profiles are still something to keep an eye on. LDL Cholesterol: This is the “bad cholesterol” that most doctors agree you should reduce (although even this is much more complicated than it sounds). HDL Cholesterol: This is the “good cholesterol” that most doctors are fine with. Triglycerides: these are another kind of blood lipid associated with cardiovascular disease – interestingly enough, the best way to raise triglyceride levels is not eating fat, but rather eating a lot of refined carbohydrates! Many of the same spices that help improve blood glucose control also help improve blood lipids (probably because insulin and blood sugar are very closely related to cardiovascular health). Several of the cinnamon studies, for example, noted that not only did cinnamon improve subjects’ blood sugar levels, but it also lowered their LDL cholesterol, and increased or did not change their HDL cholesterol. This means the subjects had an improved ratio of LDL to HDL, a pattern associated with a lower risk of heart disease. Another study specifically on cholesterol found that fenugreek powder (also familiar from the blood sugar section), used as a flavoring in any dish the study subjects wanted to eat, lowered total cholesterol and LDL. Considering that poor blood lipid profiles are so closely associated with diabetes, and that both are signs of overall inflammation, it’s not surprising that the same anti-inflammatory spices provide benefits for both. A third beneficial spice for blood lipid improvement is ginger. In a study in Iran, patients who got 3 grams (just under 2 teaspoons) of ginger every day had reduced triglycerides, total cholesterol, and LDL cholesterol compared to a placebo group. Hypertension (high blood pressure) doesn’t actually result from eating too much salt, but that doesn’t mean it isn’t an issue to be aware of. Despite how little we actually know about the causes of hypertension, it’s probably a safe bet to aim for a normal blood pressure. Amazingly enough, cinnamon comes to the rescue again here: after 2 grams of cinnamon per day for 12 weeks, a group of Type 2 diabetics showed lower blood pressure compared to controls. Spices don’t just act as antioxidants within the human body; they also help to prevent the nutritional degradation of food during storage. In one study, for example, annatto and coriander were extremely effective at preserving the valuable Omega-3 fatty acids in meatballs during storage. Although Omega-3s are very good for you, they are still a type of PUFA and accordingly they’re quite fragile and prone to oxidation and going rancid. The spices in this study helped to prevent that, keeping the fats intact and healthy rather than oxidized and inflammatory. Preventing the oxidation of these fragile fats helps avoid the creation of advanced glycation end-products (AGEs), which create oxidative stress and speed up the aging process. The best illustration of this is a recent test where researchers gave men with Type 2 Diabetes one of two types of burger patties. The first patty was seasoned with salt only. The second had salt and a spice mix containing cloves, cinnamon, oregano, rosemary, ginger, black pepper, paprika, and garlic powder. Compared to the control group, the group eating the spiced patties had fewer markers of oxidative stress: the antioxidants in the spices protected the fats in the hamburger both during cooking and during digestion. The spiced burgers also helped improve the function of the endothelium, the cell layer that lines the inner surface of blood vessels. Impaired endothelial function is one major risk factor for cardiovascular diseases, so this represents a significant cardiovascular benefit. This is a dramatic illustration of how spices can help make your food better for you by reducing these small problems that aren’t noticeable individually but add up over time. If you like to cook once a week and freeze the results for quick and easy dinners all week long, this is definitely a benefit to pay attention to. Delayed-Onset Muscle Soreness (abbreviated DOMS) is familiar to any athlete who’s ever pushed it a little too hard in the gym and woken up the next day barely able to move. But did you know that your post-workout meal could save you some of that pain? In this study on female martial artists, one group of researchers found that 3 grams (slightly less than 2 teaspoons) of ginger effectively reduced muscle soreness. 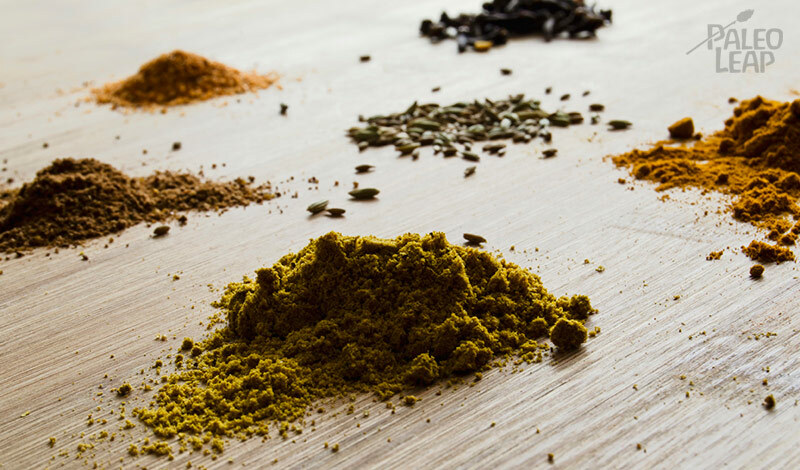 As it turns out, our gut flora love spices just as much as we do, and they seem to be particularly fond of turmeric. A spice instantly recognizable for its bright golden-yellow color, turmeric is most frequently used in Indian and Southeast Asian cuisine. In this study, subjects ate curry either with or without turmeric. After their meal, researchers tested the subjects’ breath to see how much hydrogen was in it. The turmeric group had more hydrogen in their breath, and the carbohydrates in the meal seemed to be moving through their small bowel faster. These are both signs of a healthy response from the gut flora. Another study, which gave subjects 72-144mg/day (less than 1 teaspoon) of turmeric for 8 weeks reported that digestive symptoms were significantly improved in the intervention group compared to a placebo group. Interestingly enough, this study measured IBS symptoms, but in people without diagnosed cases of IBS, suggesting that turmeric is beneficial even for people without serious pre-existing problems. This might seem like a no-brainer (of course nobody wants to eat bland food, and obviously if your food tastes better, you’ll like it more and want to keep eating it), but it’s worth mentioning just in case Paleo is starting to feel a little boring. 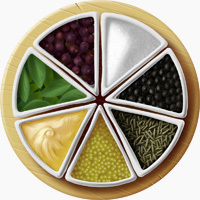 One of the best ways to keep yourself enthused about cooking and experimenting in the kitchen is to try a new spice, and anything that keeps you out of the clutches of delivery pizza or takeout Chinese definitely counts as a health benefit. It’s sometimes surprising how often traditional folk remedies actually turn out to be useful when we start studying them in a lab. Ginger has traditionally been prescribed to pregnant women as an antiemetic (an anti-nausea drug) to help treat morning sickness. And now we can tell from studies that it actually works. As well as being less expensive than prescription drugs, this also has safety benefits: unlike harsh pharmaceuticals (most famously thalidomide), ginger does not carry any risk of birth defects. With the equipment in modern labs, we can now confirm that this old wives’ prescription is quite effective. After several smaller studies, a 2005 meta-analysis showed that 1-1.5 grams of ginger every day (about 1 teaspoon) was not only effective for nausea in pregnancy, but also free from potentially dangerous side effects. There haven’t been any studies specifically on ginger for other types of nausea, but if you always get bad motion sickness on planes or in cars, a cup of ginger tea is definitely worth a shot! Capsaicin, the active ingredient in red pepper and hot peppers, gets a lot of press for its metabolism-boosting effects, but there are two big problems with this. First of all, the studies that show this effect rely on enormous quantities of red pepper, much more than anyone would ever want to eat unless they took it in a pill. And secondly, this miraculous metabolic effect only amounts to approximately 50 calories/day, even with such extreme doses. So sprinkling red pepper flakes on your salad unfortunately won’t get you very far in terms of increased calorie burn. What it might do, though, is help prevent junk food cravings in the first place. One study gave subjects approximately 1 gram of red pepper flakes (as part of a meal, representing a normal food consumption of red pepper) and found that after eating a meal with the red peppers, subjects were less preoccupied with food, and had lower desire to eat fatty, salty, or sweet foods. Interestingly enough, this effect was stronger among people who didn’t normally eat spicy foods, suggesting that spice-lovers eventually get used to the flavor and need to eat a little more to get the same effect. Another study found that after a lunch flavored with chili peppers, subjects showed no sign of thermogenic benefits, but did have decreased levels of ghrelin (the hormone that tells you when you’re hungry). In other words, they felt fuller after eating. Another study confirmed this: after eating a bowl of red-pepper-flavored soup, subjects voluntarily ate less at the rest of the meal. In this study, though, the dose had to be high enough to register as “spicy,” suggesting that the taste of the red pepper is just as important as the other biochemical aspects. Whenever possible, buy whole spices and grind them yourself. This ensures that the spices will be as fresh, flavorful, and nutritious as possible. Light, heat, and moisture are deadly to your spice collection. Store spices in opaque tins that seal tightly. As much as you can, try to keep them away from e oven and stove. If you want to store them for more than a few months, stick them in the freezer and defrost as necessary. Ethnic markets are usually better sources for spices than grocery stores, since they have a higher turnover, so the spices are likely to be fresher. They’re also usually much cheaper. Buying spices online often saves a lot of money, since you have the option of buying them in bags and re-using your own jars. Like ethnic food stores, online retailers will also often have fresher stock, because they sell out faster. The same goes for buying them in bulk at a health food store. Another spice-buying tip: save your money by avoiding spice blends (pumpkin pie spice, for example). It’s a lot cheaper just to buy the ingredients and mix them up yourself. Cinnamon (for blood sugar, blood lipids oxidative stress, blood pressure, and cardiovascular health): cinnamon chicken, apple cinnamon fruit rolls, or baked apples. For an even simpler way to enjoy cinnamon, shake it over winter squash or sweet potatoes. Hot peppers (for cravings): jerk chicken, spicy pork chili, spicy pulled pork, or spicy scallop salad. Ginger (for nausea and DOMS): ginger-citrus roast chicken, sweet potato lime soup, or Thai coconut soup. Ginger is also delicious as ginger tea, which you can buy in teabags or simply make yourself by boiling some cut-up pieces of ginger in water for about 10 minutes. Turmeric (for gut flora): green chicken masala, chicken tajine with apricots, or Moroccan-style roast chicken. Alternately, add it to some homemade mustard to get the bright-yellow effect that you’re used to. Fenugreek (for blood sugar and blood lipids): add it to anything Indian or Middle Eastern, like curried shrimp and spinach or shakshuka. Or play around with it in recipes that can work with any combination of spices, like this warm broccoli slaw. Other spices (for food preservation, reducing oxidative stress, and adding flavor): salad dressings and vinaigrettes often have a lot of spices already in them: use them as marinades to give your meat a flavorful health boost. Or use a dry rub (a mix of spices without oil or vinegar) to add punch to your meat before grilling or roasting. Alternately, it’s also beneficial to simply include more spices in your everyday cooking. Vegetable recipes are perfect for this – something very basic like oven-roasted cauliflower can become the base for any number of spicy additions. What if I Don’t Like Spices? Are you sitting here reading all about the benefits of hot peppers with a sinking heart because you just can’t stand the stuff? You’re not alone – plenty of people just aren’t spice people. But don’t feel guilty about it: nobody has to eat spices to be healthy. They’re more like a bonus on top of an already excellent diet. If you really can’t stand them, don’t force yourself to choke them down. The most important thing is to eat healthy food you enjoy, whether or not it’s full of turmeric or fenugreek. Sometimes the healthy choice is also the tasty choice, and the numerous health benefits of common spices are the perfect example. And you’ll notice that all the research cited in this article used amounts that a person could reasonably eat in their food: these aren’t effects that come from injecting cinnamon into mouse livers or bathing test-tube cells with marinades. They’re real, significant, and delicious health benefits that you can get just by doing something that tastes better anyway: definitely a win-win for everyone concerned.